Very, very rarely do I teach something and think, "Wow. That went really well!" In fact, I think it's happened exactly once. And it happened with the chain rule, which for some probably brings back horrible memories of first-year college calculus. For whatever reason, it couldn't have been more different in my calculus classes and I wanted to share my strategy in case someone else might find it helpful. 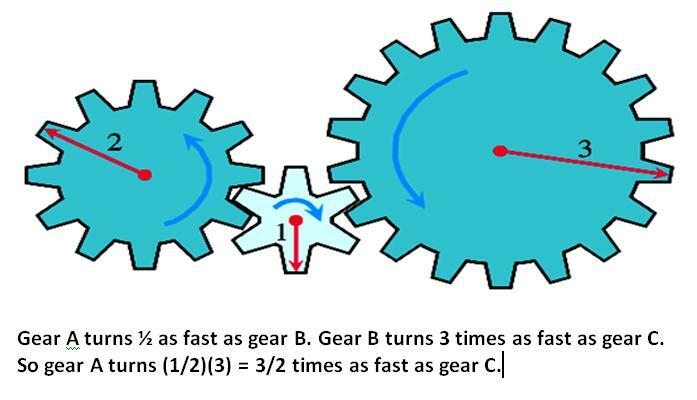 I was inspired by Think Thank Thunk's use of gears to teach the chain rule and by Sam J. Shah's box method. I started out with a simple gear example. We worked as a whole class because I didn't have enough gears set up for all the kids to play around, but they had actually just finished discussing gears and gear ratios in their engineering classes (yeah, my school's that awesome) so it worked fine. The moral of the story is that when you compose gears, speeds multiply. They got that. I then invoked a little poetic license to use "gears" as a metaphor for functions and "speeds" as a metaphor for derivatives. They were confused. I don't blame them. But THEN we put it all together and the confusion turned to glee! (Okay, maybe not quite glee, but you get the point...) After asking them what kinds of functions we don't yet know how to differentiate, we came to the conclusion that even though we know how to take the derivative of 2 to the power of x, we don't know how to take the derivative of 2 to some function of x. The conversation goes something like this: "What's the first thing that happens to x?" 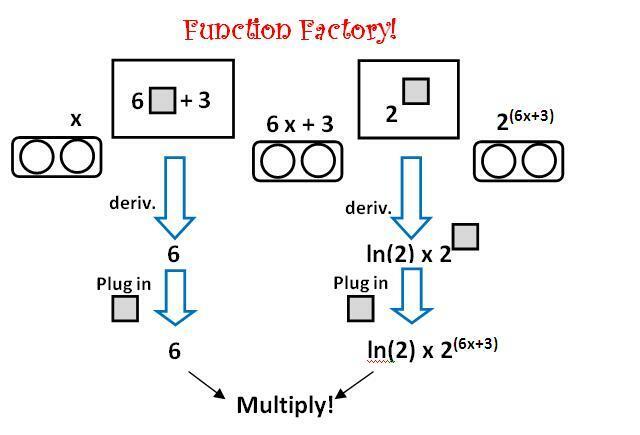 "It gets multiplied by 6 and added to 3." "Right, so it goes into the 6 blah plus 3 machine. What does it come out as?" "6x+3" "Then what happens to it?" "It gets raised by a power of 2" "Right, so it goes into the 2 to the blah machine. What does it come out as?" "2 to the 6x+3." "Are we done?" "Yes." When we go to take derivatives, we'll say stuff like: "The derivative of '2 to the blah' is 'ln of 2 times 2 to the blah'." Although I'm pretty sure this "blah" nonsense is standard language when it comes to the chain rule, it's still kind of funny to see my kids at the board saying things like "2 to the blah." When they parrot those funny things back at me, I have that strange realization that sometimes they're actually listening to what I say, and if they are then it goes down into their notebooks as Calculus with a capital "C". And what would Newton think of "2 to the blah"? Sometimes I worry about these things. Anyway, we loved the chain rule. By the end of the first class, they were begging me to put a really crazy one on the board. At the beginning of the period, I had made them repeat after me: "I will not be afraid of the chain rule." At the end of the class, they asked why I had made it seem like it would be so scary - it was the easiest thing they had learned all year! 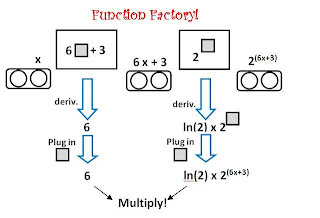 I must admit that part of me wished they had to suffer through the chain rule just a *tiny* bit more by learning about u-substitution or whatever awful way I first learned it, but of course as teachers we must resist the urge to do things a certain way simply because that's how we learned them. Nice! I like to teach the chain rule using projection functions. The derivative is magnification and they all naturally think that if you have a 5x lens and then do a 3x lens that the total magnification is 15x. "but of course as teachers we must resist the urge to do things a certain way simply because that's how we learned them." How do I foster inquiry?